Intense political pressure is coming in the way of smooth flow of traffic in the city with drivers of private buses and those of the transport department making unscheduled halts whenever and wherever they please. A city court has remanded three accused caught on the charge of preparing fake documents for sending people abroad to 14-day judicial custody. Chief Judicial Magistrate (CJM) Harreet Kaur remanded the accused, including two boys Ajay Kumar of Shivaji Nagar locality, Surinder alias Shammi working at a photocopy shop at Gopal Nagar and a girl Neha of Gopal Nagar to 14-day judicial custody. Four persons, including a woman, were injured in a clash between two groups of residents over a Ganesha Chaturthi procession march in Jalandhar Cantonment, this morning. The problem started when a section of Mohalla 10 residents asked a resident of Mohalla 6 to shift his car parked on the internal road in front of his house to enable them to take out a procession. A gang of burglars struck once again at Hardware store in Attar Singh Colony of Khushropur village and decamped with wall paints and lakhs in cash late last night. Owner of Armaan Paints and Hardware store, Mandeep Singh found the main shutters of his store broken this morning after which he informed the police. Jalandhar, the sports capital of the state, got a reason to cheer as two of its sports stars from the field of Hockey and Swimming & Water Polo returned home after receiving the prestigious Dronacharya award and Major Dhyan Chand award from the President of India, Pratibha Patil. 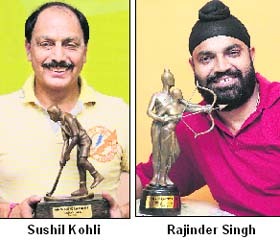 The Dronacharya Award was conferred on ace hockey player Olympian Rajinder Singh, while Sushil Kohli, a name to reckon with in swimming and water polo received the Major Dhyan Chand Award on August 29. As many as 20 educational institutes, nine hotels and six hospitals of the city have become house tax defaulters to the Municipal Corporation. The information has come as a reply to an application filed under the Right to Information (RTI) Act by activist Rajesh Agnihotri. The government elementary school, Kot Sadiq, is a bundle of problems, the major ones being lack of furniture and an unsafe building. Since its inception, the school hasn’t had furniture and students sit on narrow rugs laid down on the floor. Members of the Jalandhar Improvement Trust (JIT) are sympathetic towards the demand that even the second or third time allottees getting their sale deeds made for the first time should also be covered under its schemes. Iqbal Singh Sandhu, SDM, Jalandhar, gave away prizes to the winners of the district-level rural (inter-block) tournament at a function held at local Hans Raj Stadium today. He said sports and academics should get equal emphasis in life. The members of Punjab Government Transport Workers Union today demanded a fair probe in the recently busted scam of kilometre scheme of Punjab Roadways at Jalandhar Depot-I. NCC cadet Gurpreet Kaur of the local Prem Chand Markanda SD College for Women, Jalandhar, has bagged Sahara scholarship of Rs 12,000. She is the only NCC cadet in the senior wing of the Jalandhar Group to get the scholarship. So much so that cops posted at the exit of the local Inter State Bus Terminus (ISBT) are helpless in stopping the buses from halting them, incidentally this place is hardly at a stone's throw from the office of the city traffic police head office. Officials, however, admit that they are unable to curb the menace as a majority of the buses are owned by politicians. They mount intense pressure whenever there is any crackdown by the authorities concerned. Nevertheless, more cops will be stationed at such points when ever additional staff is sanctioned to them, officials claim. The problem has aggravated over the years as the awareness drives launched by the police to educate the public against flagging down buses at unscheduled spots has failed. While it is the duty of the police to regulate traffic, the general public too should cooperate and board buses from the bus stand and the authorised places. 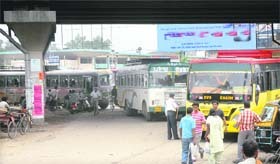 "It is not only the private bus operators but also the drivers of the transport department who have been promoting theses unauthorised bus stoppages as they stop their vehicles here and even wait for the passengers for minutes together, claimed Tej Prakash Sharma, a resident of Gurunanakpura (West) who commutes daily from the city to Goraya. There are five unauthorised stoppages starting from the ISBT till Rama Mandi Chowk on the Jalandhar-Rama Mandi stretch of the GT Road and three such stoppages on the Jalandhar-Amritsar section. The bus operators plying on different routes have been illegally stopping their buses next to the main exit of the ISBT, the main gate of the Lyallpur Khalsa College, BSF Chowk, PAP Chowk and Rama Mandi intersection on the Jalandhar-Rama Mandi stretch. Interestingly, the illegal bus-stoppage that is next to the main exit of the ISBT is hardly 50 yards from the office of the Assistant commissioner of City police (traffic wing). Chugitti, Adda Hoshiarpur Chowk and Pathankot bypass are the three unauthorised bus stoppages on the Jalandhar-Amaritsar section of the GT Road. These spots are some of the major bottlenecks in the smooth flow of the vehicular traffic on the GT Road. A majority of these buses allegedly belong to politicians and influential persons of the state and the drivers of these buses hardly follow traffic rules. The Tribune team even noticed the employees of these private bus operators indulging in scuffles among themselves to pick maximum number of passengers at these stoppages. “The conductors of the private bus operators virtually push the passengers into their vehicles and there after asked them the destinations they wanted to go. They even ferry the buses to a long distance and then drop the passengers who are virtually 'dragged' into the vehicles,” revealed Pradeep Sankhyan, a resident of Jalandhar Cantonment area. Authorities allegedly fail to initiate steps due to intense political pressure. Five unauthorised halts on the Jalandhar-Rama Mandi stretch of the GT Road and three on the Jalandhar-Amritsar section. The illegal halts are just next to the main exit of the ISBT, main gate of the Lyallpur Khalsa College, BSF Chowk, PAP Chowk and Rama Mandi intersection on the Jalandhar-Rama Mandi stretch. Chugitti, Adda Hoshiarpur Chowk and Pathankot bypass are the three unauthorised bus stoppages on the Jalandhar-Amaritsar section of the GT Road. One such halt is next to the main exit of the ISBT is hardly 50 yards from the office of the Assistant commissioner of City police (traffic wing). Earlier, they were remanded them to two-day police custody when they were produced in the CJM court on Tuesday. The police personnel posted at Division number four of Jalandhar City Commissionerate nabbed the three accused from different locations on Monday. However, two of their associates, Ashok Pradhan and Happy, are still absconding. Ajay Kumar of Shivaji Nagar locality was caught with fake documents near Friends Cinema. Ashok Kumar was passing through the area near Friends Cinema when he was signalled to stop. After a search, a number of fake documents were recovered from his possession. The police took him into custody and seized the fake documents, including identity cards, registration certificates of different vehicles and registries of immovable properties. On preliminary questioning, he told the police that these fake documents were used to send people abroad and for other various purposes. Ajay Kumar also informed the police during preliminary questioning that he used to get these documents prepared from a typist Neha of Gopal Nagar. At this, the police arrested her. Neha told the police that she used to get prepared the fake documents with the help of Surinder, alias Shammi, working at photocopy shop at Gopal Nagar. The police also nabbed him and seized the computer, scanner and other relevant items from the shop. The got to know that Ashok Pradhan and Happy were involved preparing the fake documents. However they are still at large. An advocate by the profession, the car owner Harbans Dogra had allegedly parked his car on the road for the past six months, the residents alleged. according to the Station house officer, Jalandhar Cantonment police station, Vijay Kumar, there were arguments between the procession organisers and Dogra which later on took an ugly turn. Following arguments, Dogra called his men and later on members of both the groups got involved in a clash, leaving four members of a group injured. The injured have been identified as Neeraj Watts, his wife Shruti, residents of Mohalla No 10, their friends Kuldeep Sharma and Ricky. The injured were later admitted to the Civil Hospital. Meanwhile, the Jalandhar Cantonment police have registered daily diary reports (DDRs) against members of both parties, terming it a case of allegations and counter allegations, revealed Vijay Kumar. The victims and the suspects had not turned up to get their statements recorded till filing of the report. Mandeep Singh, a resident of Khushropur, said the burglars used iron rods to break the shutter and the lock. They broke the inner door made of aluminum to enter the store, he said. The miscreants also stole Rs 50,000 from the cash box, he said. Mandeep Singh, in a complaint to the Jamsher police post under Sadar police station, said the burglars took away boxes of paint. Before fleeing from the scene, the burglars ransacked the store. Investigating officer, ASI Rajpal Singh said a case under Sections 457 and 380 of the IPC has been registered against unidentified persons. A team of forensic experts and also pressed to service this afternoon. The police has laid a tap of nab the suspects, he added. Jalandhar, the sports capital of the state, got a reason to cheer as two of its sports stars from the field of Hockey and Swimming & Water Polo returned home after receiving the prestigious Dronacharya award and Major Dhyan Chand award from the President of India, Pratibha Patil. The Dronacharya Award was conferred on ace hockey player Olympian Rajinder Singh, while Sushil Kohli, a name to reckon with in swimming and water polo received the Major Dhyan Chand Award on August 29. The players were accorded a warm welcome by the players in the city. For Dronacharya Awardee Olympian Rajinder Singh the announcement of the Dronacharya Award came as no big surprise. It was rather expected, he says. The ace hockey star quoted perfection in hockey and his contribution to the national game of the country as his major achievements. "This honour was expected. I had applied for the first time and got selected. I received a call from the selection committee on August 18. Even my previous awards also came well on time leaving me with nothing more to ask for," he said. The former chief coach of Indian Hockey team went to Delhi along with his family to receive the honour. "Those were great moments as it is an honour for my years of contribution to hockey at the national and international level," he added. Rajinder who had earlier received the coveted Major Dhyan Chand award in 2005 said that for him churning out the best hockey talent for the Indian Hockey team is the mainstay. "At present three of my players from Punjab and Sind Bank namely Gurwinder Singh Chandi, Sarwanjit Singh and Ravi Pal Singh are playing in the national team. Recently we conducted the selection trials and hope to bring out some more promising players," he said. Talking about the status of women hockey in Punjab, he said, "It is matter of great concern that women hockey has come to a standstill. While Haryana has become the frontrunner in hockey and almost all games, Punjab is on a constant decline. There was a time when women hockey players from Punjab were a big name in the national squad." "Lack of better job opportunities in government and semi- government sectors have also been the major reasons for the downfall of the game. The state government has a major role to play if they restart the 'B' grade hockey tournaments which in turn will help in generating jobs", he said. The Dronacharya awardee has played in the Los Angeles Olympics 1984, Asian Games 1982, Essanda World Championship 1983, Sultan Azlan Shah Hockey tournament 1983 and many other such international tourneys. He represented national hockey championships from 1979 to 1989. While as a coach, he was the chief coach of National Men's Hockey team from 2005-06, chief coach of National Women's Hockey Development team for international hockey tournament at Japan in 2004. The Olympian also remained the selector of Indian Women Hockey team (junior) from 1998 to 2001. A name to reckon with Sushil Kohli, the recipient of Major Dhyan Chand Award is the only aquatic player in India who played swimming and water polo simultaneously not only at the national but the international level. Ace swimmer from Punjab thanks the union government for the honour he received from the President of India on August 29. "I am glad that my name was forwarded by the Swimming Federation of India Punjab Sports department. It was a special moment and I had gone to Delhi along with my extended family to receive the award," he said. Kohli owns a sports manufacturing unit in Jalandhar while his son Taruvar Kohli is a cricketer. Talking about his association with the game he said, "I was the captain of the Indian Swimming team for the first Asian Swimming championship held at Dhaka and won a silver medal." After this he took part in the Asian Swimming championship held in 1982 and won a bronze medal. Even after his retirement he has been contributing to swimming and water polo by providing training to the budding swimmers. "At present I am associated with District Swimming Association as its general secretary and wish to see more support coming from the state government to uplift of this game," he added. Members of District Swimming Association also held a press conference in the honour of Kohli and highlighted the need for an honour by the Punjab government too. "The state government should recognise the achievements of Sushil Kohli and provide adequate infrastructure to uplift this game. The list has the names of some well-reputed institutes including MGN Public School, Guru Amar Dass Public School and PCM SD College for Women. The biggest defaulter among the schools is Hemkunt Public School with an outstanding amount of Rs 30.6 lakh. Among the hospitals, dues to the tune of Rs 9.22 lakh and Rs 9.02 lakh are due from Bhagga Hospital and Berry Hospital, respectively. The two main defaulters among the hotels are Lorango and Kumar Hotels with Rs 6.61 lakh and Rs 6.56 lakh, respectively. The MC officials have said the defaulters who had not deposited the tax had been served notices under Section 137 and 138 of the PMC Act. The government elementary school, Kot Sadiq, is a bundle of problems, the major ones being lack of furniture and an unsafe building. Since its inception, the school hasn’t had furniture and students sit on narrow rugs laid down on the floor. In all, the school has 241 children and since the school premises are marked by heavy undergrowth, the threat of insects looms large. “But that is how it’s been since the school was started in 1961. In June this year some officials came to enquire about the furniture, but nothing has been done do far,” says in charge Anita. One of the wings of the school lies abandoned because it is unsafe. Though the unsafe wing doesn’t house any classroom, one of the rooms is used to store the mid-day meal supplies. “The building is under the PWD. Officials have been coming in to check it, but no action has been taken about it as yet.” Teachers say the school premises would be safer if it is razed down. “The supplies have been kept there because there is no kitchen. We are getting a kitchen constructed and after that the stuff would be removed from there,” says Anita. Interestingly, the new kitchen is also coming up through funds which, among leftover government funds, include contributions made by school teachers themselves. Talking about the state of the school, Block Master Teacher (West One) Devinder Singh says the school is one of the seven schools (another one being the neighbouring Government High School, Kot Sadiq, which is short of 50 desks) in the block, which are short of furniture. “But the problem in this school is very acute,” the BMT says. On the administrative front too, the school has a peculiar problem. Though the government hires Central Head Teachers (CHT) to take care of school supervision, the present in charge of the school, despite being a primary teacher, is doing the duty of a CHT, managing nine schools. “The CHTs get paid better salaries than us. But I have been doing the job of a CHT even though I get paid as much as a primary teacher. I have to manage the postal inflow of nine schools. All the information to these schools is consolidated by me and on top of that I have to manage my school too. I have written to the BPEO about it but I await action,” the teacher in charge says. Despite the problems, the school staff has been continually lauded for maintaining a well kept record room, which gives children access to many beautiful story books and literature as well as wooden geometrical models. The trustees discussed the matter at length at a meeting held recently. Since the deadline of the government notification in this regard is on September 30, the members have demanded a quick decision on the issue. SE Mukul Soni said the second and third time allottees were not allowed to get deeds made on the original rates following a letter to the Trust from the tehsildar on the issue. He said the Trust would now write back to the tehsildar giving its opinion in the matter. Trust chairman Baljit Singh Neelamahal said estimates had been passed for water supply, sewer facilities and construction of few roads at its proposed 94.97-acre Surya Enclave Extension scheme for Rs 1.83, 1.84 and 1.98 crore, respectively. “An amount of Rs 1.5 crore was sanctioned for development of parks in Maharaja Ranjit Singh Avenue and Surya Enclave. An amount of Rs 50 lakh were approved for the water supply, roads and parks in the upcoming Bibi Bhani Complex. An additional estimate of Rs 7 crore was passed to upgrade Guru Gobind Singh Stadium. The funds would be used to construct canopies to cover the entire spectator’s gallery,” he said. Harbhajan Singh, a third-time allottee in Surya Enclave said he had been taking rounds in the office of the Jalandhar Improvement Trust making a similar point but no one had paid a heed. “I strongly feel that the notification is clear on giving relaxation to get the first conveyance deed for any property but the officials are deliberately sitting over it,” he said. Final results: Athletics (Boys)-Adampur (first), Jalandhar West (second) and Bhogpur (third). Athletics (girls)- Adampur (first), Jalandhar West (second) and Lohian (third). Hockey (boys)-Jalandhar East (Sansarpur), Nakodar (sarih) and Jalandhar East (Kukkar Pind). Hockey (girls)- Rurka Kalan (Jandiala), Jalandhar East (Kukkar Pind) and Jalandhar East (Lambra). Basketball (boys)-Adampur (first), Jalandhar West (second) and Shahkot (third). Basketball (girls)-Adampur (first), Shahkot (second) and Jalandhar West (third). Handball (boys)-Phillaur (first), Jalandhar East (second) and Rurka Kalan (third). Handball (girls)-Jalandhar East (first), Phillaur (second) and Rurka Kalan (third). Kho-kho (boys)-Adampur (first), Bhogpur (second) and Rurka Kalan (third). Kho-Kho (girls)-Adampur (first), Rurka Kalan (second) and Jalandhar East (third). Kabaddi (boys)- Shahkot (first), Nakodar (second) and Lohian (third). Kabaddi (girls)- Phillaur (first), Bhogpur (second) and Shahkot (third). Volleyball (Boys)- Jalandhar East (first), Bhogpur (second) and Nurmahal (third). Volleyball (girls)-Jalandhar West (first), Shahkot (second) and Bhogpur (third). Wrestling (boys)-Jalandhar East (first), Nakodar (second) and Nakodar (third). Football (boys)-Rurka Kalan (first), Adampur (second) and Nurmahal (third). Organising secretary of the union, Avtar Singh Tari said the officials involved in this scam should be taken to task immediately. The union members also said the claims of the General Manager of Depot-I, Inderjit Singh Chawla, that the accused conductor Viney Kumar belongs to our union is completely wrong. He said while the union was demanding action against the officials, the GM in turn had started shifting the union leaders duties against this move. “We stand united for a strict action against the other officials involved in this scheme and will continue to raise voice until something is done”, they added. The scholarship is awarded to those NCC cadets who perform well in studies as well as in the NCC. Colonel HK Madan from 2 Punjab Battalion and college principal Kiran Arora have congratulated Gurpreet. Kanya Maha Vidyalaya, Jalandhar, organised a talent hunt during which the students participated in events like group dance, solo dance, songs, skits, fancy dress and modelling. College Principal Dr Atima Sharma gave away prizes to the winners. Results- Megha was declared Miss Fresher. Skit-'Bhua Marriage Bureau' bagged the first prize, Fancy Dress-Jogi (first), Punjabi Solo Dance- Rakhi (first), Duet song- Prabhjot and Purnima (first), Punjabi Group Dance- Spicy Eight group (first), Western Group Dance- Crazy KMV group (first). The Department of Science of Kamla Nehru College for Women, Phagwara, celebrated Malaria Awareness Day. A power-point presentation was shown to the students highlighting the causes, symptoms and prevention of malaria. The Department of Cosmetology of Prem Chand Markanda S.D. College for Women organised competitions in nail art, mehndi art, body art and hair styling. Results- Mehndi-Richa from M.Com -I stood first, Nail art-Pratisha from PG Diploma in Cosmetology stood first, Body art-Monu Kalra won the first position and in hair styling contest Nikita stood first. Ajit Singh, regional manager, State Bank of India, RBO, Jalandhar, recently presented fans to the principal of the Government Primary School Mithu Basti, Jalandhar, along with the staff of the State bank of India, Harbans Nagar, Jalandhar branch. Students and staff members Sudesh, Neha and Anju were also present on the occasion.